The new version fixes a problem affecting operation with 10.14 Mojave Dark Mode. The new version fixes a minor bug where the absence of EXIF meta-data was not handled correctly. The new version adds support for HEIC and HEIF image files. This is a minor maintenance release. This release fixes a minor bud on macOS 10.12 Sierra. This release features some minor bug fixes and improved mailing list sign-up. This release modernizes the code base for Mac OS X 10.11 El Capitan. This release improves the installation experience. This release fixes an OS X drawing bug that could cause the window background to appear empty. This release fixes moves to the new Automatic Reference Counting memory architecture. This release fixes a bug in the batch folder naming algorithm. This is the first Mac OS X 10.7 Lion or later only release of the product. It features an improved integration with the Mac App Store version of the tool. The new version fixes a Mountain Lion-related problem. The new version adopts Apple's Developer ID identification in preparation for Mac OS X 10.7 Mountain Lion. Unfortunately, this makes it impossible to preserve the droplet feature and this version thus removes this feature. Existing droplets should continue to work correctly. The new version can now be used in the Mac OS X 10.7 full screen mode. This release fixes a bug in the id3 tag reading engine. This release fixes a conflict resolution bug. This release adds support for reading meta-data in flac, ogg and aiff sound files. This release addresses a sorting and an mp3 tag reading issue. This release features a brand new ID3 tag engine for reading the embedded song, artist and album information of your music files. The new engine is up to ten times faster. More improvements to supported formats and tags are coming soon. This is particularly useful when splitting up existing folder hierarchies for backup. This release fixes a problem affecting music file processing. 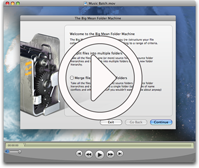 This is the first Mac OS X 10.6 Snow Leopard and Intel CPU-only release of "The Big Mean Folder Machine". The internals of the tool have been throughly modernized in anticipation of the migration to XCode 4 and the upcoming Mac OS X 10.7 Leopard developments. Now that "The Big Mean Folder Machine" has been accepted into the Mac App Store, this new version makes it easier for customers to download the trial and buy from the Mac App Store. It also warns customers that the Mac App Store currently lacks the droplet feature as it fell foul of Apple's Mac App Store Guidelines. A Mac App Store version with droplet support is under development. This is also probably going to be the last Mac OS 10.5 Leopard compatible release. We usually support the current version of Mac OS X and one previous version to allow customers plenty of time to upgrade. Apple has, however, made a number of moves in the last few weeks that make it harder than ever to maintain backwards compatibility. The Mac App Store requires that code be targeted to Mac OS X 10.6 Snow Leopard and Apple's XCode 4 development tools that have gone to Gold Master last week have dropped the Mac OS X 10.5 SDK and PowerPC support entirely. In other words, the time has come to get ready for Mac OS X 10.7 Lion and drop Mac OS X 10.5 Leopard compatibility a few months early. Obviously, the current, 2.13 release will remain on the website indefinitely and we've made sure that the auto-update feature won't overwrite your current version with an incompatible Mac OS X 10.6-only version by mistake. This new version allows you to switch off the debugging information being written to the system console. Internally, a lot has changed in preparation for submitting the product the Mac App Store. The new version fixes a startup problem introduced in version 2.11. The new version fixes a minor problem with the way in which settings are saved to droplets. The new version improves performance and memory management. The new version adds the ability to split folder hierarchies based on file creator and type codes. The new version delivers improved handling of missing EXIF information when creating folder hierarchies. The new version delivers improved handling of missing EXIF information during the batch folder creation stage. The new version adds a 4th hierarchy level, as well as making significant backend improvements. Droplets can now be safely auto-updated to the latest version of the program via the software update mechanism. This new release now correctly calculates the physical (size on disk) and logical (actual number of bytes) sizes of bundle files. This release contains significant improvements to the handling of unlock codes and should make unlocking the product significantly less error prone. Allows the program to be run more easily for users who do not have administrator privileges. Fixes a crash on Snow Leopard when reading mp3 tags. Version 2.0 is the first major upgrade to "The Big Mean Folder Machine". Best of all, version 2.0 is a free upgrade to all version 1.x owners. The new version fixes a number of minor issues, including the auto-update feature which was broken in the first (two?) beta(s). Version 2.0 is a free upgrade to all version 1.x owners. This new beta fixes a number of minor issues. This is the first public beta of "The Big Mean Folder Machine" 2.0. This new version makes important speed gains and improves conflict resolution and memory management. Fixes the merge feature which became broken in 1.6.7. The new version improves the performance of reading EXIF digital camera meta-data and fixes the problem that lead to version 1.6.6 being pulled. 11th March 2009 - Pulled! This release was pulled because it appears to be affected by a bug in Mac OS X 10.5 Leopard. The new "Preserve original case wherever possible" option works correctly, but under some circumstances produces an incorrect preview and reports non-existant errors which can be confusing. A bug report is being filed with Apple (update workaround found!). The new version now allows the folders in newly created folder hierarchies to preserve the case of the original names that it contains. Beyond the user-visible changes there are many internal changes to further improve the performance and reliability of the processing engine. The new version delivers significant performance gains throughout. In typical scenarios the conflict resolution step is now up to ten times faster making for a much zippier experience. The new release becomes a 64-bit garbage collected application on all 64-bit systems. This should allow for improved scalability and reliability when dealing with very large processing jobs. This new release significantly speeds up hierarchy creation and reduces the memory footprint of the application. Fixes a bug affecting the "split into hierarchies" feature introduced in 1.6. This is the first official Mac OS X 10.5 Leopard-only release of this title. This product right from the start used operating system features first introduced in Mac OS X 10.4 Tiger and then refined in Mac OS X 10.5 Leopard. As development went on, we hit many limitations of the Tiger implementation of those features that prevented us from delivering the rapid pace of improvements that we were targeting. In recent releases, a disproportional amount of effort went into maintaining backwards compatibility with Tiger and we've come to the conclusion that this time and energy would have been better spent moving the product forward at an increased pace. This first Leopard-only release contains only nuts & bolts changes that ready the product for more Leopard-only developments. The new version now remembers your settings between different sessions and allows you to create "droplet" mini-applications that store frequently used settings and allow you to re-apply them to the content of new source folders via simple drag & drop. Adds support for creating self-contained droplet mini-applications that can be used to store and re-apply frequently used settings via simple drag & drop. Small fix for the MP3/AAC support. The new version adds the ability to make the creation of deeper hierarchy levels dependent on the number of files on each level. It also restores MP3/AAC support for the splitting feature. This beta restores MP3/AAC support for the splitting feature and fixes a few bugs in the first beta. This beta adds the ability of making the creation of deeper hierarchy levels dependent on the number of files per level. It is released as a beta because it makes significant internal changes and there is thus potential for new bugs to have crept in.. we have tested the new version extensively but if you notice anything please let us know at reiff@publicspace.net so that we can fix it before the version goes "final". Adds support for using id3 tags in mp3, m4a, m4b and m4p iTunes Music Store music files to split music collections by album, artist, etc. Improved performance, stability and scalability. This releases fixes Tiger compatibility which was broken by version 1.3. The new version now allows files to be moved as well as copied, thus greatly speeding up large batch jobs. This release broke Mac OS X 10.4 Tiger Compatibility and only worked correctly under Leopard. This is the first full release of this software. The third beta significantly expands the "Split Files into Folder Hierarchies" feature, by allowing you to define your own splitting criteria, based on the names or the time and date attributes of your files or digital photos. After our initial product name "Big Bang" seemed to already be taken, the icon and artwork for the renamed "Big Mean Folder Machine" is now ready. We hope you'll enjoy it! This is the very first public release of this product. Version 2.39 fixes a problem affecting operation with 10.14 Mojave Dark Mode. Downloads for current and older versions of Mac OS X. This is the first place you should look for solutions to common problems, including how to un-install.